Telemundo's first ever super seriesspinoff El Chema ranks as the #1 Spanish-language program in primetime, delivering 2,435,000 total viewers and 1,434,000 adults 18-49 on premiere night, outperforming Univision at 10 p.m. by +22% and +63%, respectively, according to Nielsen. Starring Mauricio Ochmann, the series reached a cumulative audience of 3,089,000 total viewers and 1,827,000 adults 18-49. Locally, El Chema ranked #1, regardless of language among adults 18-49 in Los Angeles, New York, Houston, Chicago, San Francisco, Orlando and Miami, where it also ranked #1 among total viewers. 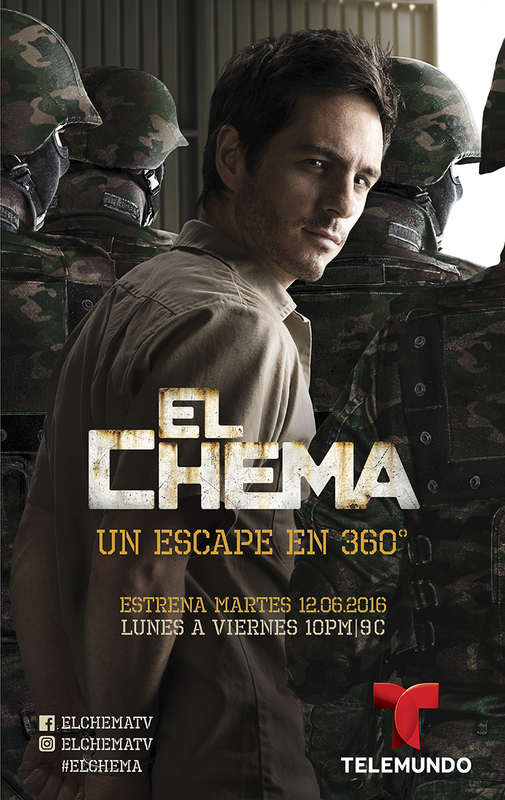 In a first time ever for Spanish-language television, TELEMUNDO launched a virtual reality experience called "El Chema 360°", which has generated 3,700,000 global views to date. On Facebook, the video generated 2,600,000 global views. The El Chema Facebook page generated 1,400,000 global video views on Facebook and 63,000 global actions across social channels (Facebook, Twitter and Instagram) on the day of the premiere. An original Telemundo production made by Argos Televisión, El Chema tells the story of how Chema Venegas (Ochmann) got his start in organized crime and rose through the ranks to become the head of the cartel he runs in El Señor de los Cielos. Chema began breaking the law at a young age, transporting marijuana across the US-Mexico border when he was just a boy. Little by little, he worked his way up to become a successful and skillful leader, earning his place through bloodshed and brutality, in the history of drug trafficking. Since he was a young man, Chema has been one of the most important public enemies of both the US and Mexican governments. Source: Nielsen 12/6/16, NPM L+SD IMP TEL vs SLTV nets; Fastie Reach w/6+ min qual. NSI L+SD, Ranking based on P18-49 & P2+ IMP for 10p-11p time period (vs UNI, UMA, AZA,ETV,MMX). Adobe Analytics US Only, 12/6/16. Shareablee, 12/6/16; YouTube Analytics, 11/21-12/6/16; Tubular Labs, November 2016.